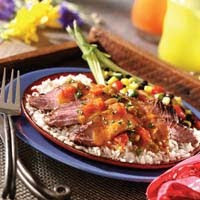 Picante sauce puts just the right amount of "fire" in this flavorful marinade for grilled flank steak. This is a great recipe to impress warm weather company, or for any day you want a tender and scrumptious steak. This entry was posted on 10:45 PM and is filed under Beef . You can follow any responses to this entry through the RSS 2.0 feed. You can leave a response, or trackback from your own site.